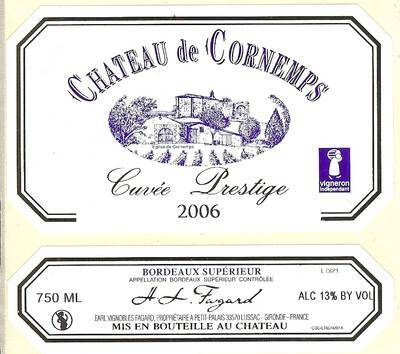 This vintage arises from the best plots of land of the vineyard of CORNEMPS: the oldes and best exposed vineyards. A passage in barrels of new oak brings its notes afforested to offer a complex, aromatic wine of guard. Identical to CORNEMPS Tradition. A particular care is brought to the management of the returns by the technique of the targeted cutting. - In spring, disbudding that allows to decrease and to spread the number of grapes,- In summer, a targeted cutting by grapes allows to create a good aeration and to eliminate the grapes having a delay of maturity. The takings and the tasting of the grape and the pits determine the beginning of the grape harvest. The best lots are going to be converted into wine and followed till the end of the fermentation, with a management by the temperatures and the very frequent tastings. 2 passages of 6 months in barrels of oak (average heating) renewed by third. Jolie robe grenat aux reflets brique. Bien charnu, nez délicat où se mêlent pruneau et cassis, vin ample et solide, bouche soyeuse. A déguster dans les 10 ans. Un rôti de veau bien doré, un poulet aux morilles, un plateau de fromages accompagneront la subtilité de ce vin. 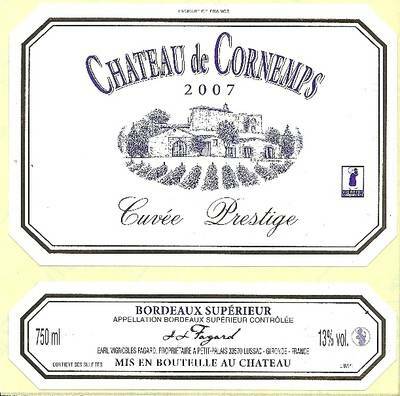 "You"ll be seduced by this Bordeaux Superieur Prestige 2006, which is dense, generous, with complex aromas, silky tannins, having both structure and finesse. This is a wine that fills the mouth and would be an excellent choice to go with a navarin" (or any other meat dish).